Chuck Wagon Wheels…Too Big, Too Small or Just Right? "John Linstroth's brand was one of the region's oldest..."
From its inception as a French trading post in 1764, Saint Louis, Missouri was destined to be more than just another river town. The position of this ‘Gateway to the West’ on the Mississippi, along with its proximity to the Missouri river, made it a natural setting for some of the most recognized western vehicle makers in America. Joseph Murphy, Louis Espenschied, Phillip Weber, Caspar Gestring, John Henry Luedinghaus and Henry Damme all called the city home. So strong was the area’s draw to vehicle builders that even at the turn of the 20th century, there were still nearly 200 carriage and wagon makers/repairers in St. Louis. 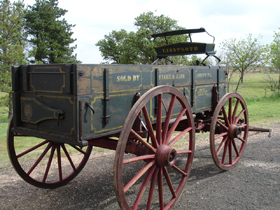 Among those already mentioned was the Linstroth Wagon Company. Established in 1849, Henry Linstroth’s brand was one of the regions oldest and was still listed in period directories into the 1940’s. Using an image of a strutting peacock with a wide tail fan, the Linstroth company promoted itself as “The Pride of St. Louis.” They were well known, especially in the South and Southwest regions, for their expertise in manufacturing stake, farm & log wagons. Like any farm equipment or vehicle manufacturer today, Linstroth was quick to highlight the superiority of its products over others. Among the features touted was the use of clear, straight grain hickory for axles… wheels boiled in linseed oil before being painted…. white oak hubs…. and tires set hot by hand. They also trussed the underside of each axle with a flat strap of iron for additional hauling strength and structural support. One of the curious traits of Linstroth is that the gears were often through-bolted and not clipped. 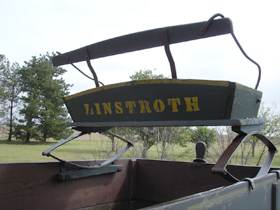 Recently, we got a good look at a well preserved Linstroth that had found its way to Kathy Christensen’s Midwest Buggy Company of Lockney, Texas. Well known for her chuck wagon cooking, championship competitions and restored western vehicles, Christensen’s client base includes old west enthusiasts and vehicle collectors across the country. 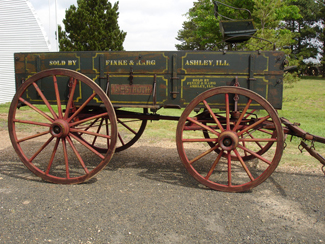 In fact, Christensen recently sold this high wheel Linstroth to a collector in Arizona. Quality vehicles with so much original paint are not only difficult to find in the 21st century, but they typically command a generous price tag. This double box example spans 38 inches in width (outside to outside) and 10 feet, 6 inches in length. 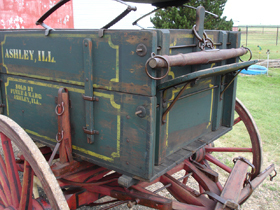 The wagon’s pin striping, selling dealer signage, overall paint design and logos are still quite strong and legible. Wheels measure 44 inches on the front and 52 inches on the rear, while the butcher-knife-style narrow tires check in at one and a half inches wide. According to Christensen, center-to-center track measurements are 63 inches, making this a wide and extremely stable wheelbase. 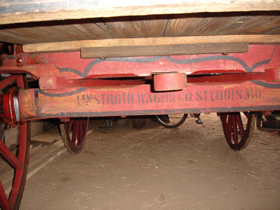 The rear axle is marked – Linstroth Wagon Company St. Louis, MO. Elsewhere, the wagon also retains the original box tighteners which would have helped keep loose grain from leaking out the sides of the box. Through the normal course of use and the likely passage of at least three quarters of a century since the wagon was built, it’s logical to expect this workhorse on wheels to be missing some key parts. Amazingly though, it still has its original folding endgate, spring seat and tongue. Combined with a spreader chain and factory-fitted footboard, this staple of the farm has appreciated considerably from the time when it would likely have sold in the $200-$250 range. Like all other wood-wheeled wagon designs, time and progress finally caught up with Linstroth and by the late 1940’s there was no longer a place to even buy parts for the wagons. Today, these classics of the past serve relatively light duty in museums, private collections, chuck wagon competitions and other special events. They are a reminder of our nation’s legendary western heritage and the steadfast determination of a people fixed on the opportunities of America and The Pride of St. Louis. As we continue to profile America’s distinct western vehicle brands and their associated stories, we encourage you to drop us a line at info@wheelsthatwonthewest.com. We’re always interested in highlighting additional vehicles and look forward to talking to you about yours.